Simply put animal chiropractors look for abnormal or restricted movement of the joints of the spine and extremities which have an effect on the nervous system and the entire body. The goal of the animal chiropractor is to restore proper movement of the affected joints so the nervous system and body can function at its maximum healthy potential. How do you adjust an animal? Basically chiropractic care is a manual method of treatment. The word “Chiropractic” comes from the Greek meaning “To perform with the hands”. 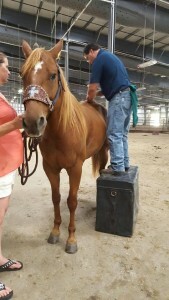 Adjusting an animal is somewhat similar to being adjusted by a human chiropractor in that once the animal chiropractor finds an area that has either decreased or restricted motion, the doctor applies a high force, low amplitude thrust specific to the anatomy of the joint thereby restoring normal movement. The first visit takes approximately 20 to 30 minutes. Then any follow up visits take approximately 15 to 20 minutes. Can an adjustment make my animal worse? Sometimes after the adjustment the animal can be sore. If performed correctly and with proper training, chiropractic is safe and effective in treating your animal. Sometimes during an adjustment the animal can experience discomfort for a brief moment. How long does my animal need to be off? Generally the animal should have the remainder of the day to rest. Each animal is evaluated on an individual basis and the doctor will provide you with the best course of action that is right for your animal(s). What kind of training does a certified animal chiropractor have? They are certified either by the AVCA (American Veterinary Chiropractic Association) or the IVCA (International Veterinary Chiropractic Association). There is NO Board certification in animal Chiropractic. Using a Mallet or Hammer. Using an instrument to click all the way down an animal’s spine without checking each joint of the spine and extremities for abnormal or restricted movement. Dragging a horse on the back of a truck to “Adjust” their back. A bone is “out of place”. The correct answer: If a bone were out of place this would be a dislocation. Chiropractors “Crack backs”. The correct answer: The noise you might hear especially in humans is gas releasing in the joint being adjusted. All joints have a capsule that has a gas in them to keep the bones from rubbing together. You can commonly hear this “crack” noise when you pull your fingers to “crack” your knuckles. After approximately 15 to 20 minutes the joints refill and you can then “crack” your knuckles again. It’s unusual to hear this “crack” noise when adjusting animals.